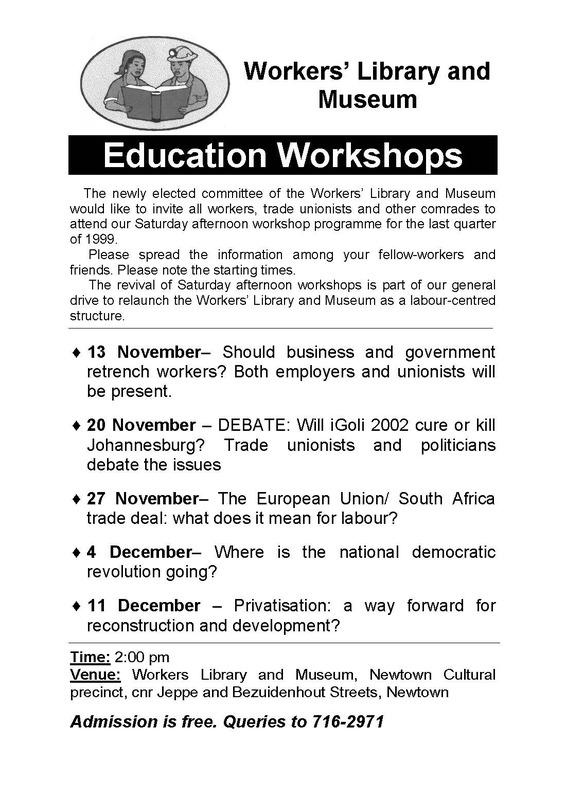 From around 1998 into around 2003, I was involved in coordinating the Workers Education Workshops at the Workers Library and Museum (WLM) in Johannesburg; I was also vice chair for quite a while, and coordinated the WLM’s Workers Bookshop. 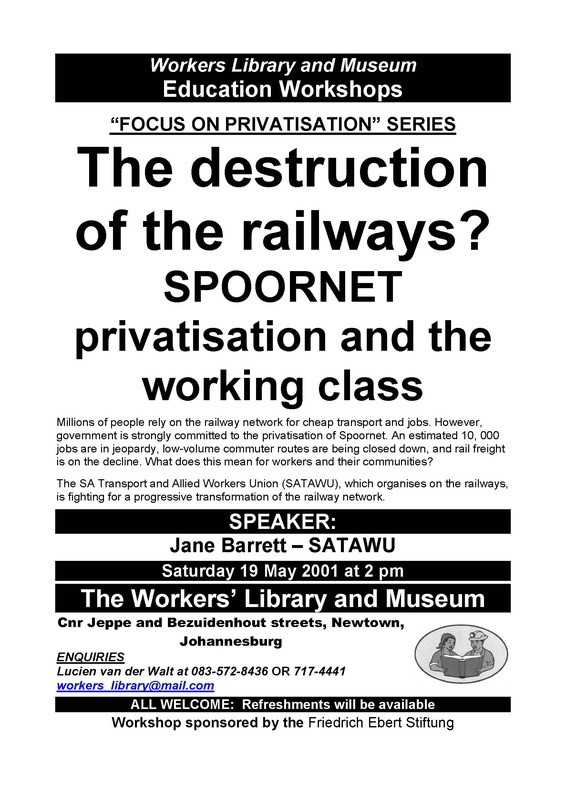 A selection of posters below will give an idea of the sort of issues covered. Attendance varied, but was usually around 30-40, mostly black working class with a sprinkling of other left activist types. 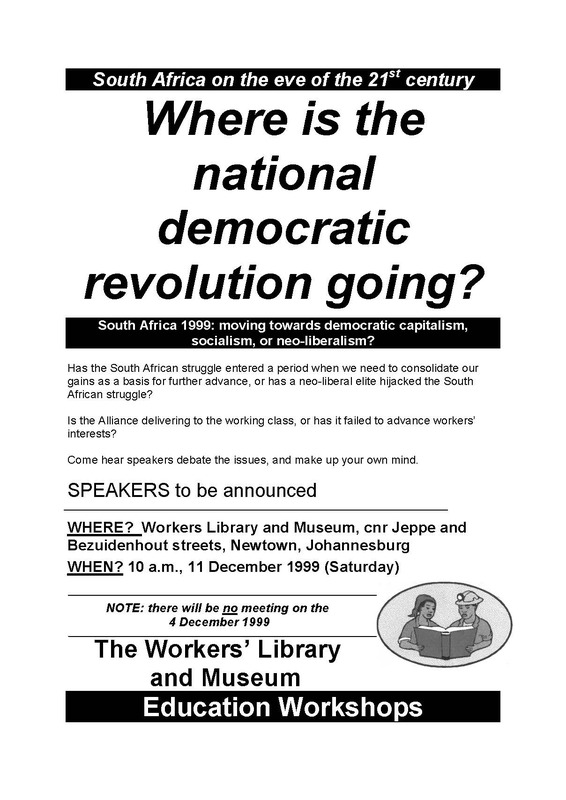 At the time, the WLM was run by an elected volunteer committee, and operated as a left-wing labour service organisation. 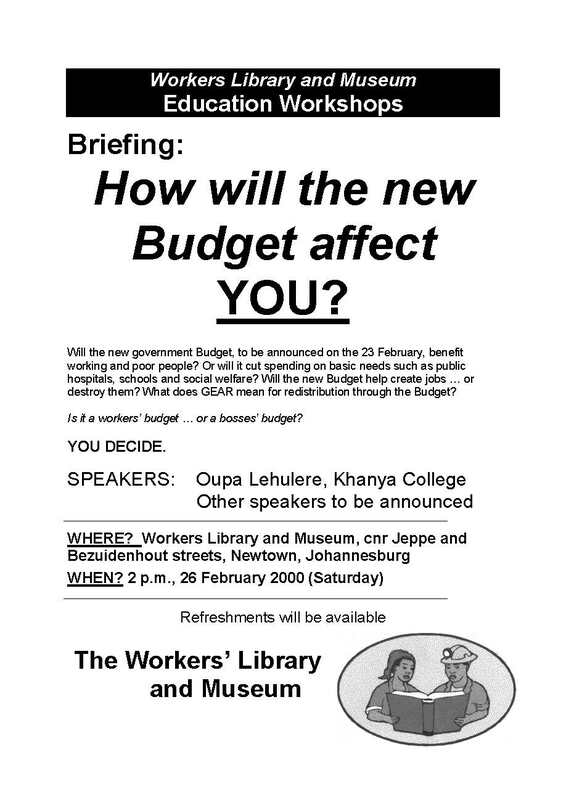 I was part of a (changing) team of excellent comrades on the committee, among whom I might mention Shaheen Buckus, the late Craig Mabuza, Mondli Hlatswayo, Bernie Johnson, Eli Kodisang (chairperson), Mandy Moussouris, Aubrey Nomvela, and Nicole Ulrich (chairperson). This was a period of revival, after serious problems in the 1990s. The WLM also provided meeting spaces and a modest (and run-down) museum. 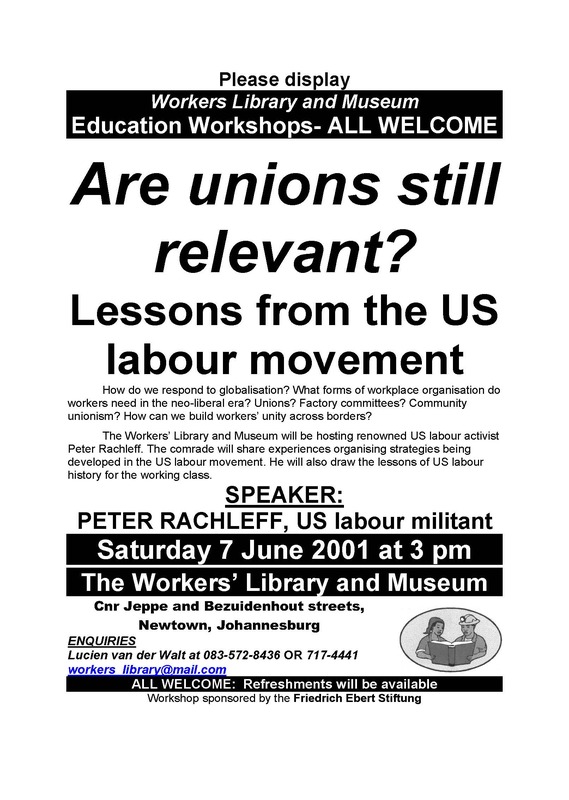 It was always short of money (the volunteers were not paid, and the staff worked part-time), but against this, it provided an important space for the revival of social movements in the late 1990s. 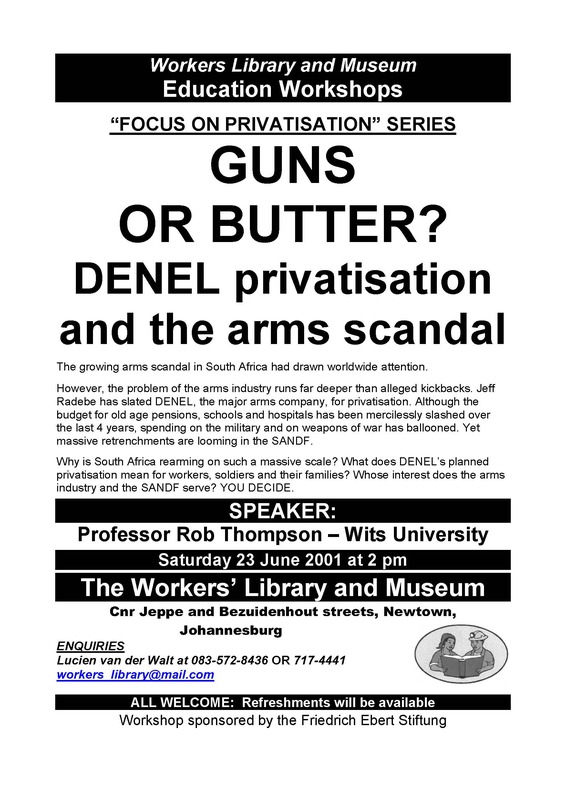 It also engaged in an ongoing way with the Congress of South African Trade Unions (COSATU), and as an educator, I spent many evenings at the COSATU Johannesburg local. It was Nicole Ulrich, above all, who revived the WLM. A great deal of time was also spent turning around the debt, a task in which Nicole was also absolutely central and vital. 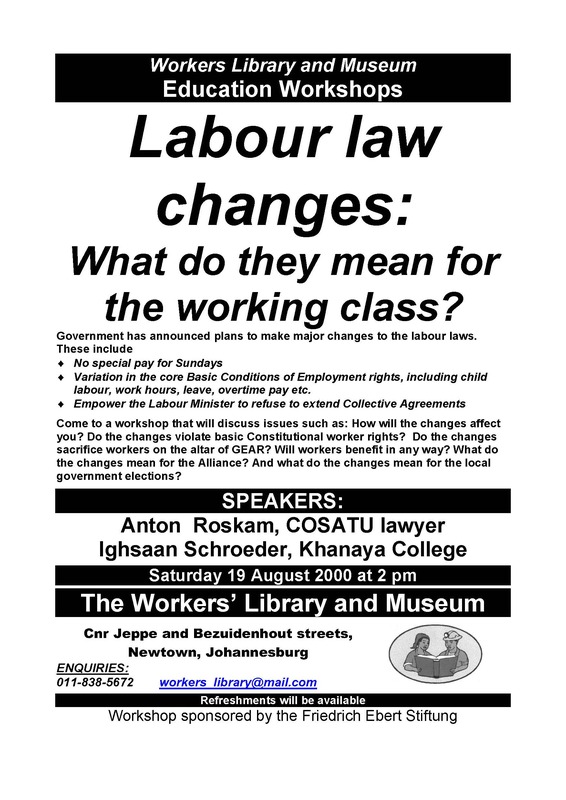 This included negotiating a partnership with Khanya College (another labour service organisation), which came to share the premises, but also dozens of other tasks, ranging from finding the old catalogues to dealing with creditors, all the while bringing a political vision into play. But I would be misrepresenting Nicole’s central role if I stressed just the nuts-and-bolts hands-on leadership she provided: the revival was all driven by her radical working class politics and by her example. Elected teams come and go, and ours largely stepped down in 2002/2003. Subsequent problems saw the old WLM disintegrate. While the worst of the town council’s plans for repositioning Newtown as a trendy yuppie zone (such as plans for building a hotel right in front of the WLM) fell through, the WLM did not survive the 2000s. 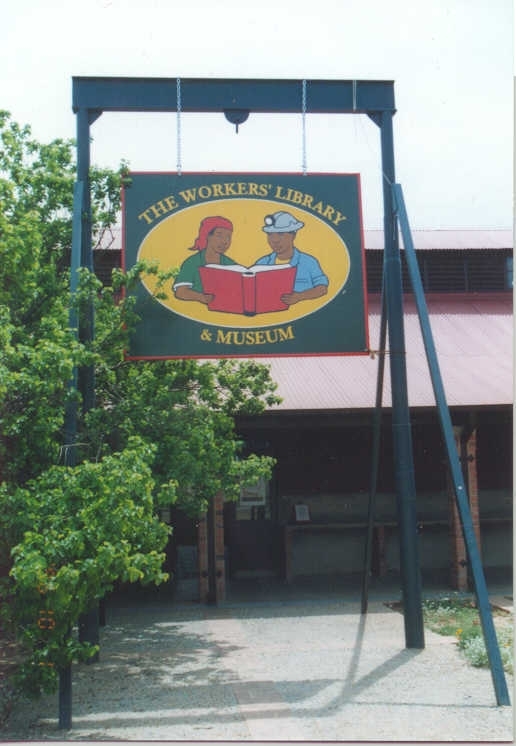 Its library section was incorporated into Khanya College, and the Museum was taken over by the Johannesburg Development Agency (JDA) and reopened as a heritage site. There is no denying the physical upgrades to the old premises under the JDA, but there is a massive change that is obscured by the new paint: a self-managed, left-wing, working class space was now part of the state’s official heritage industry, and was geared to tourists rather than working class self-education and struggle. 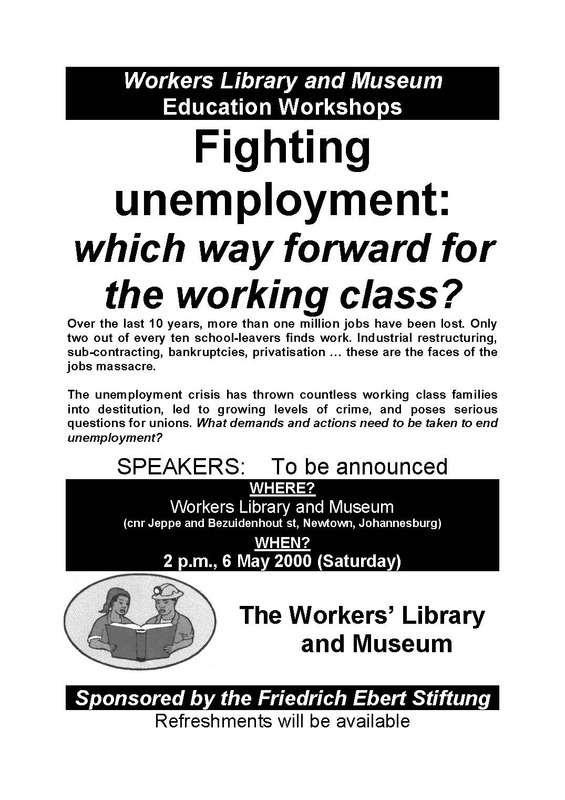 The WLM (or just plain “Workers Library” as it was then) had started in 1988, the dying days of apartheid, as a left-wing labour service organisation in the Johannesburg inner city, providing black working class militants with access to a library and meeting space. 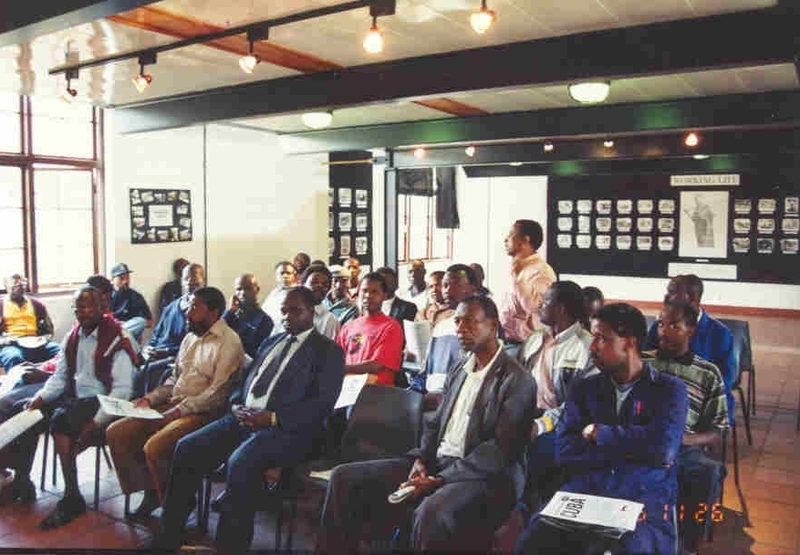 Unlike other labour service organisations, like the International Labour Resource and Information Group (ILRIG) in Cape Town, it did not undertake research, but stressed creating a radical space. In the 1990s, the WLM was housed in the refurbished compound, a wing of which was retained as a museum. Adjacent houses for the electricity management, as well as for white workers, were included. (You can read more about the history of the facility here.) The project started well, but ran into serious problems, and was then revived by the comrades of 1998 onwards. But by 2008, when those comrades had left, it was no more.